Yesterday the world said goodbye to yet another great actor Alan Rickman. It is not all that often that I bring the passing of an actor or anyone not family related into my blog but when I saw a post about his passing yesterday I was just gobsmacked. 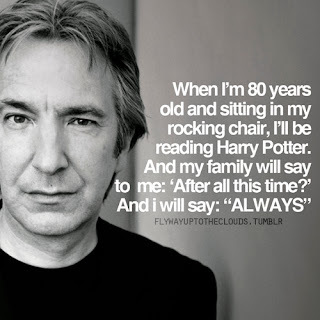 Not only did he represent a character that filled 7 years of my life in the Harry Potter movies and represents so many years of my childhood/ adolescence, but also so many other great movies and performances, he played in Alice in Wonderland, Sweeney Todd, Perfume, Love Actually, The Hitchikers Guide to the Galaxy, Robin Hood, these are but a few of the many many amazing roles he played and like Robin Williams for example he played his roles superbly, getting into the role to the point that you either wanted to hate him with all your might or hold him from the sadness of his plight. Thank you Alan for making a difference, you will be missed.